Bath’s riverside underwent a major redevelopment aimed at revitalising a previously neglected quarter of the city. 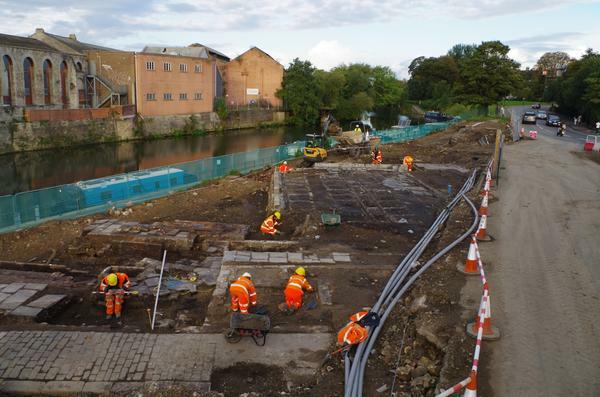 As part of these works, Wessex Archaeology was commissioned by Alun Griffiths Ltd. to undertake an archaeological excavation during preliminary flood mitigation and development-enabling works at Bath Quays. Bath’s riverside underwent a major redevelopment aimed at revitalising a previously neglected quarter of the city. 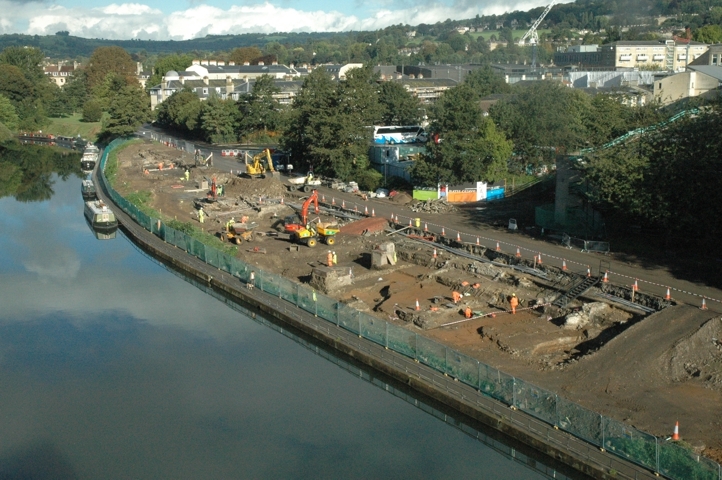 As part of these works, Wessex Archaeology was commissioned by Alun Griffiths Ltd. to undertake an archaeological excavation during preliminary flood mitigation and development-enabling works at Bath Quays. The development involves the diversion of a road and ground reduction to widen the towpath on the north side of the river to create a new public space for outdoor performances and recreation. Before the current works began, the site was a rather nondescript strip of land sandwiched between the River Avon and a busy main road. However, documentary research highlighted the fact that during the 18th and 19th centuries this had been a busy quayside, flanked by industrial buildings and tenement housing. This area, informally known as the Avon Street district, had, by the late 19th century, acquired reputation as a notorious slum, which was locally synonymous with poverty, disease, crime and prostitution. Our excavations have uncovered extensive well-preserved remains of the buildings that once flanked the quayside and have revealed evidence of how the area developed from the medieval period onwards. The site is situated approximately 100 m to the south of Bath’s Roman and medieval core, in a low-lying and historically flood-prone area. Previous excavations at Southgate produced very little evidence for Roman activity to the south of the town walls, and there is similarly little evidence for activity at Bath Quays during this period. During the medieval period, an extra-mural suburb developed between the south gate and a bridge over the Avon that provided access to the town from the south. Early maps, dating from c. 1600 onwards, show that the bridge was protected by a gatehouse. The south and east sides of the suburb were defined by a loop in the river, whilst the western approach was demarcated by an artificial watercourse flanked by battlemented wall. Our excavations have uncovered a section of this ditch, which was 6 m wide and over 2 m deep. The east side of the ditch was defined by the foundations of a substantial clay-bonded wall. This boundary is first recorded in a 13th-century document recording a land grant from Bath Abbey to the Hospital of St John. It has been suggested that the ditch and wall was constructed on the orders of King Stephen during a 12th-century civil war known as The Anarchy (AD 1138–54). However, the finds recovered during the excavation, suggest that although the ditch is probably medieval, the wall was not constructed in the late 16th century – far too late for it to have been built by King Stephen. One of the more unexpected features to be uncovered during our excavations is a small stone bridge, probably constructed in the 1690s, which provided a crossing over the partially silted medieval ditch. The bridge was subsequently incorporated into a mid-18th-century culvert which ensured its survival beneath later developments. During the 18th century, Bath was transformed from a provincial city into a fashionable spa. It was during this period that most of the neo-Classical architecture that contributed to Bath’s status as a World Heritage Site was constructed. Whilst the Bath Stone used in the construction of these buildings could be sourced from nearby quarries, other materials, such as sandstone for paving, lead, timber, slate, bricks and tiles, all had to be imported from outside the area. Unfortunately, the construction of mills on the Avon during the medieval period prevented its use as a navigable watercourse. As a result, the only method of transporting goods into or out of the city were steep and poorly maintained roads. This was clearly not an ideal situation, which was eventually remedied by the construction of the Avon Navigation in the 1720s. As part of this development, a new quayside, known as Broad Quay, was constructed at the eastern end of the site, which provided a focus for subsequent development along the riverside. 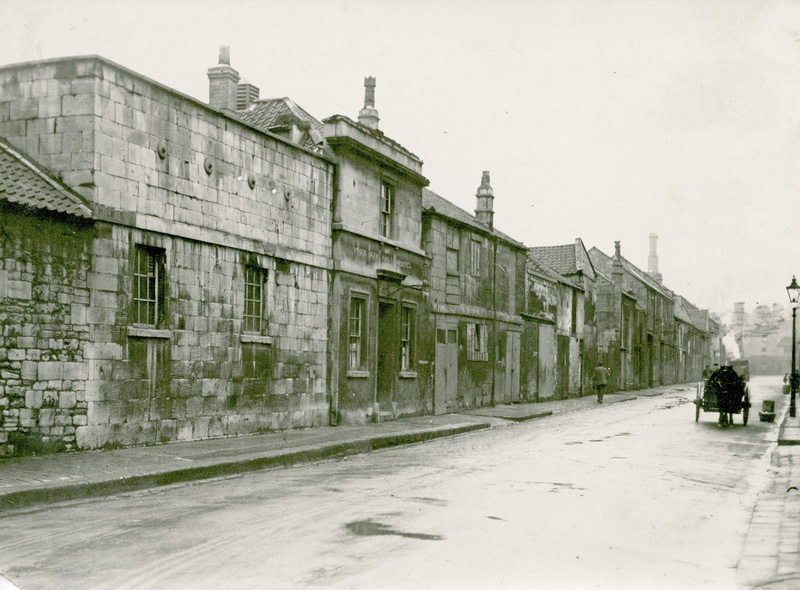 During the 1730s, a new road, Avon Street, was laid out between Kingsmead Square and the river. By the late 1750s, Avon Street was fully developed, with well-built houses that were primarily designed as lodgings for the city’s wealthy visitors. The proximity of the busy quay and competition from more fashionable developments in the north of the city soon led to a decline in the area’s status, and by the late 18th century the street had already acquired a less than salubrious reputation. 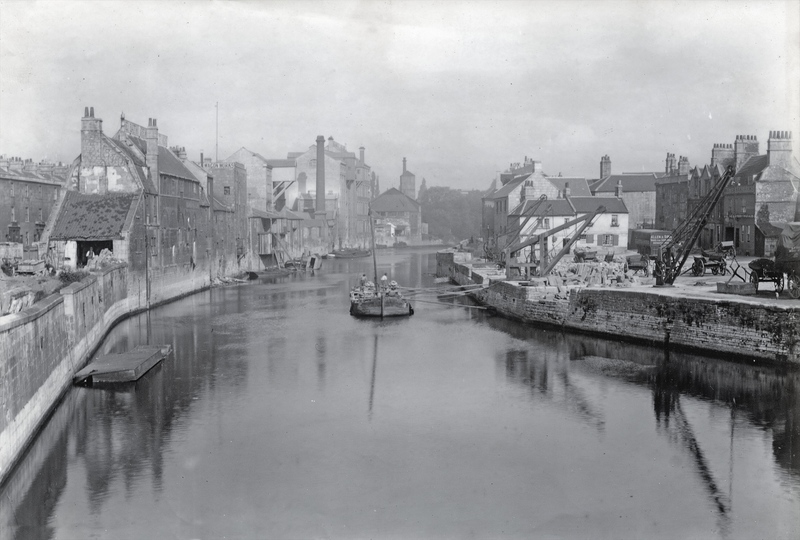 By this date, the whole area around Avon Street and the quay had been infilled with streets of densely packed houses and industrial premises. In addition to the cheap lodging houses, brothels and tenement blocks that characterised the area during this period, our excavations have uncovered well-preserved remains of a parchments works, and the Duke of York beer house – one of the many taverns that once surrounded the quayside. The opening of the Kennet and Avon Canal in 1801 and the Great Western Railway in 1841 provided alternate methods of transporting goods, which inevitably led to decline in trade along the Avon Navigation, and by extension the quay. The declining importance of the quay was, however, counterbalanced by an expansion of the industrial premises which increasingly dominated the area. The expansion of industry was accompanied by the further infilling of tenement back plots with courts of insanitary housing. Concern over infectious diseases, particularly after the outbreak of cholera in 1832, and a desire to improve the living conditions of the working poor, provided an impetus for improvements in sanitation, which is epitomised by the construction of a public wash house and laundry, known as the Milk Street Baths, which opened in 1847. Our excavations have shown that the baths were supplied with water pumped from the river, which was heated using coal-fired steam boilers. Part of the baths was divided into small cubicles were local people could hire tubs of boiling water for laundering their clothes. By the early 20th century, concern over poor housing conditions, lead to proposals to demolish the Avon Street district and redevelop it with new lower density housing. Most of the area was demolished in the 1930s, but the planned redevelopment was never fully implemented due to the outbreak of the Second World War. As a result, the cleared plots remained derelict until the area was tarmacked over for use as carparks in the 1960s. The redevelopment of Bath Quays will therefore complete a process that was initiated over 80 years ago and provide a link with the river that helped make the construction of the Georgian city possible. Wessex Archaeology is working below Bath Abbey recording the foundations and the earlier archaeology including Saxon burials and Romano-British remains. The Bath Abbey Footprint Project is a Heritage Lottery Fund project to repair the Abbey’s collapsing floor, install a new eco-friendly heating system using Bath’s hot springs, and provide new, improved space and facilities to ensure the Abbey is more sustainable, hospitable and useable for local residents, worshippers and visitors alike.